From the architectural prowess in Barcelona, the riches of the Prado and Paseo del Artes in Madrid, the historic city of Toledo to the rhythms of Flamenco, declared “Masterpieces of the Oral and Intangible Heritage of Humanity” by UNESCO in 2010, Spain is unquestionably a MICE destination that will offer a wide and diverse selection of ambiances. So for this week, MeetingPackage.com is inviting you on a journey around meeting venues in Spain and its wonderful Balearic islands where art, leisure and luxury are awaiting you and your guests. Named best resort hotel in Spain, treat your clients to a unique experience at the Gran Melia Palacio de Isora, Tenerife. Tenerife, the largest of the seven Canary Islands, is a true gem for MICE organisers. Known as the eternal spring island, the island is also home to Mount Teide, rising 3718 metres above sea level. Whether you are looking for a private meeting space or a larger ball room, Gran Melia offers over 10 meeting spaces, welcoming over 800 guests. Furthermore, a devoted Events & Meetings team will be at any team on stand by to guarantee the success of your future events. All in all, this exclusive resort will take you on a journey of luxury, delicacies & relaxation. Our second option, Hotel Camiral At PGA Catalunya Resort is another gem for MICE organisers. Located in the North East corner of Spain, this venue is the perfect location for organisers who are looking to combine business and sports activities. With two award-winning golf courses, an outdoor swimming pool and a modern gym, Hotel Camiral At PGA Catalunya Resort will... And the food? Devine! For your meetings and events, nine meeting rooms, all with natural light will welcome up to 330 guests. The hotel will give you and your guests the chance to enjoy the stunning views of the countryside as well as the possibility to tailor the meeting rooms' layouts to meet your requirements. Located in beautiful Marbella, Kempinski Hotel Bahía Estepona will guarantee your stay will exceed your and your guests' expectations. Why Marbella? We want to take you to La Concha, Marbella's highest point, rising 1200 m above sea life and invite all adventures addicts for quite an unforgettable hike. Once you reach the top, you will be rewarded by breathtaking views on the city of Marbella and Puerto Banus as well as Gibraltar. With its ideal location, Kempinski Hotel Bahía Estepona offers a package of history, culture and gastronomy... all the needed ingredients for a memorable stay. For your business events, choose from five meeting rooms and one conference room, where you can accommodate up to 240 guests. All the meeting spaces have the latest technology, and an experienced staff will be more than happy to help you organise your event. With its Avant-garde and elegant Art Deco interior design, Urban Hotel is a luxury hotel located in the heart of Madrid. And when we say the heart of Madrid, we really mean the heart of Madrid: all the main attractions are within reach, including the Paseo del Prado, Puerta del Sol, Plaza Mayor and the Retiro Park! And for our food lovers, this is the place to be. Urban Hotel's restaurant, CEBO, was recently awarded its first Michelin star. So step in and let you surprise by head-chef Aurelio Morales' exquisite meals. For your events, Urban Hotel can accommodate from 8 to 300 guests for any type of event thanks to their modular spaces. For a unique atmosphere, La Terraza del Urban with swimming pool will offer a magical view of Madrid. And for a night out, Madrid’s Gran Vía is located just a few steps away! Last but not least, we present Claris Hotel, another luxurious 5-star hotel in the centre of Barcelona. 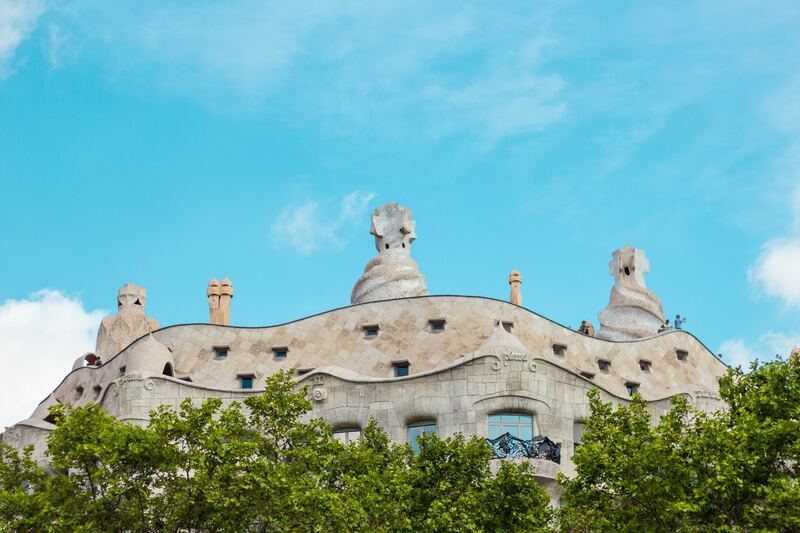 Ideally located in the heart of Barcelona, art lovers will be able to enjoy some of architect Antoni Gaudí's most famous master pieces. Furthermore, the hotel decorated each of their rooms with a unique art pieces, making this venue a wonderful art gallery. For your meetings and events, Claris Hotel Barcelona also offers modular meeting spaces, making sure you can create the perfect atmosphere for your event, whether you need to create a private and formal atmosphere, a product launch or a cocktail party. Did we tell you that La Terraza del Claris rooftop restaurant is the perfect choice to spoil your guests with the wonderful views of Barcelona?